Life gave me some lemons. It's ok, I made delicious lemonade. Now I like lemonade just fine, but if we’re going to aspire to grand words like “rich” or “financial independence” on this blog, it seems to me I should set my sights a little higher than lemonade. Maybe something with a little more zip, say, a lemon drop martini, a limoncello, or lemon vodka — or, with my sweet tooth, maybe something more like lemon meringue pie. I’ve experienced several of these and have mentioned some along the way in past posts. When I was in college, and when I was first out of school, I foolishly ran up credit-card debt—with the last chunk of debt even more foolishly based on the idea that I would soon be making “plenty” of money. I’ve had my compensation adjusted in ways that were not to my liking. I’ve had actual losses in investments, particularly stock investments—and I might have considerable paper losses in the stock market, depending against what point in time I might compare against. And I’ve developed some computer-use or repetitive-use issues with certain joints that have ended up dictating treatments not fully covered by my health insurance. You learn a valuable personal-finance lesson or lessons that help you take better control of your personal finances and reach new heights, perhaps heights you wouldn’t have reached without having started out with lemons. You reinforce a valuable personal-finance lesson or lessons that you mostly knew and maybe that you even planned around, increasing your personal-finance expertise all the more or giving you a story to relate to others to help them (e.g., your emergency fund helping you ride out a setback). You gain perspective outside of personal finance and learn or reinforce what’s important outside of personal finance—and what’s more important than personal finance. They only looked like lemons—but in actuality were a new and great opportunity all along. I’ve done a few of these too. Once I got a handle on how stupid I was being in running up credit-card debt, I educated myself on personal finance and turned completely around—I paid the debt down, I became quite focused on saving (and then investing), and I never carried a credit-card balance again. If I hadn’t run up the amount of debt that I did, I might have “coasted” for quite a while longer, not running up debt but not accumulating wealth either. When I got over being ticked off about my compensation adjustment, I checked out my other job opportunities. There were many, which was comforting. But all involved trade-offs. Some involved more money but involved a heavier workload (and likely considerably more time away from my family). Some involved less money. Ultimately, I decided to stay where I was. I had a reasonably good year and earned a bonus that essentially left me in the same place as I would have been had my compensation not been adjusted. I have other examples—possibly equally boring—but the lemonade path I’d like to discuss and highlight is the last one: They only looked like lemons—but in actuality were a new and great opportunity all along. This is the path that I think is probably the hardest to get on—and perhaps the most important to seek out. It’s really a mindset. If you recall my discussion of the Success Factors Of The Really Rich?, this was one of the themes I culled out from the two magazines discussing how successful folks achieved their success. The U.S. News magazine described the “super rich” in this light: “Where some may see risk, they see opportunity.” This can be recast and applied here: Where some may see setbacks, they see opportunity. Some might see dropping out of college a setback, an impediment to earning higher income, and generally a set of personal-finance lemons. Bill Gates found this path to have much better opportunity. Some might see having your company file for bankruptcy as a pretty sour experience. Donald Trump emerged from that experience, ultimately attaining even more vast financial success. No, I’m not recommending dropping out of college or trying to learn business by plunging into bankruptcy. But I am saying that personal finance—including dealing with setbacks—is largely mental. Largely how you look at it and how you choose to deal with it. Kinda cheesy, kinda “self-help”-aisle-in-the-bookstore stuff. What about you? 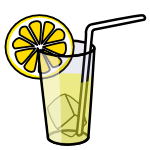 Can you share a lemons-to-lemonade story or some lemonade recipes or advice?